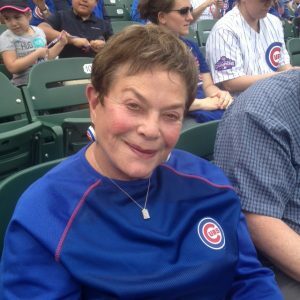 No matter what unusual sights she witnessed or good people she encountered, Carol Haddon made her seat right next to the Cubs dugout appointment viewing, as she has done from three different locations at Wrigley Field since 1971. A honor on the field would not be as impactful as an invitation to sit with Wrigley Field’s 75-year-old Grand Lady on Thursday, April 12, to take in the unique atmosphere of the 104-year old ballpark from her front row and (off-) center vantage points. Carol Haddon in her new seat next to the enlarged Cubs dugout on April 12, 2018. And we seem a century removed from Haddon and mother Ruth Stern journeying all the way from the Chatham neighborhood on the far South Side via bus and Jackson Park L in the mid-1950s to see the Cubs and their matinee idols on Ladies Day. 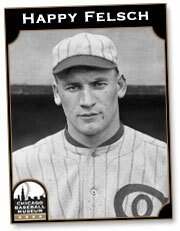 An afternoon at Clark and Addison, even in those losing years, seemed so stress-free compared to dad Rudolf Stern’s childhood in Dusseldorf, Germany. He had gotten out just in time prior to the onset of the Holocaust.